Bring water, milk, Country Crock® Spread and salt to a boil over high heat in medium saucepan. Slowly stir in grits. Reduce heat to medium-low and cook covered, stirring occasionally, 5 minutes or until thickened. 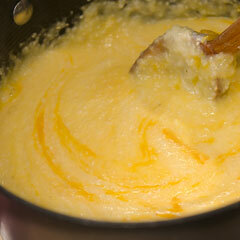 Stir in cheese and let stand 2 minutes or until cheese is melted. Stir before serving.